Let’s take a closer look at the tradition of using icons, especially by the Eastern Orthodox Church. I attended my Son-in-law’s baptism in to the Eastern Orthodox Church. I wasn’t sure what to expect. I was aware that they utilized icons, and relied heavily on extra-biblical traditions in the practice of their faith. If we are honest, very many Churches practice traditions that are not in the Bible. They aren’t necessarily wrong, but they are also not necessarily right. I am not a member of the E.O.C. I had some questions about some of the traditions I witnessed. I asked around, and everyone was quite eager to answer my questions. They were pleasant, and friendly. I had a nice time talking with several of the folks after the baptism and first communion. I also took some free booklets home with me for further reading. One of the booklets I took was titled, “No Graven Image” by Jack Sparks, Ph.D. I figured that this would be geared towards a person who was not familiar with their traditions and should give at least a rudimentary explanation of their tradition of using icons. I was correct. Although I didn’t find any of the explanations very compelling. A painted picture, of a Biblical scene, for people to appreciate, is different than bowing to, kneeling in front of, praying to/through, or kissing a picture, as if you are doing it to the person depicted. Christian themed art is not the same as venerated icons. I am not willing to say that every person in the E.O.C. views and understands icons the same. I am also not willing to say that all of them are idolaters. I am willing to say that I don’t agree with the blurring of lines that comes along with calling it, honoring, or veneration. I want to make it simple. If you believe that you can pray to a dead person to have them pray for you, you are wrong. Christ is our intercessor. We pray to Him. We don’t need a Priest. The office of Priest is also fulfilled by Christ. Of course, that is a topic for another discussion. If you kiss the picture of Jesus, while thinking and feeling like you are kissing the real Jesus, you are wrong. I also don’t agree with their use of Mary icons. I didn’t get a booklet for that. I did ask about it though. They esteem Mary in excess. Not like the Roman Catholic’s do, but still more than I believe they should. If you think that looking at an artistic rendering of Jesus, is going to help you have a deeper experience of faith, I would posit that perhaps you don’t have a high enough view of scripture. Jack Sparks argues that as Christians attempt to emulate Jesus, or Paul that they should also use icons to help them. I disagree. Sparks says, “When Orthodox Christians honor an icon of one of the saints by bowing before it, they are intent upon the godly example of that saint and upon following that example.” I don’t see any value in what he asserts. I think we should derive our knowledge of their character and behavior from scripture. We know of them from scripture. It is their character and behavior we emulate. We don’t use icons for that. We use the word of God. 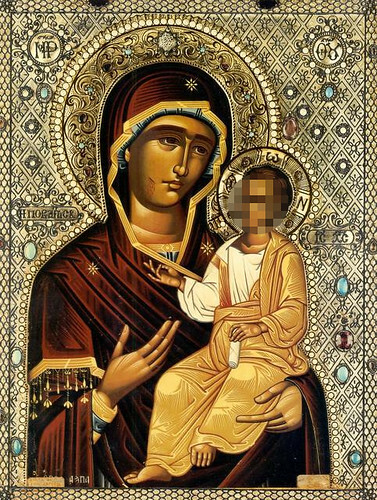 There was no direct Biblical support provided to justify the tradition of icons. The scriptural support cited as evidence in the booklet had little to nothing to do with the topic of idolatry or in justifying the Eastern Orthodox position. Sparks also cited works of some early Christians as historical support for their traditions. I can always do the, “My church father can beat up your church father thing” but that would be counterproductive. Just because they did it in the past doesn’t mean we should still be doing it. I can understand how in a time before mass circulation of printed books, how they would rely more on pictures to tell a story. I get it, but it is not the same. It has taken on a ritual of its own. It has become idolatry, even if it didn’t start out that way. There are some within the E.O.C. who don’t use the icons in an idolatrous manner, but I think that it is a detriment to the faith. I think it is a tradition that needs to go away. We have the fullness of God’s word, given by progressive revelation over the years. It is the most printed book in the world. It is widely available in many languages, even for free from different ministries. We should be reading it, and regarding the content therein, as much higher and better than pictures. The booklet compares people’s misplaced respect of Pastors, or the Bible, to the Eastern Orthodox treatment of icons. Just because people do something doesn’t make it Biblical. I don’t think people should venerate the Bible, but rather the contents of it. It contains the word of God. I don’t agree with respecting Pastors over any other brother. We don’t even have the title in the Church I attend. We have Elders. They are not held in any higher regard than anyone else. They are servants. I realize many of the folks in the E.O.C. are probably very Bible literate and do in fact esteem the word of God highly. When I say that they don’t have a high enough view of scripture it is in comparison to their desire to experience their faith in some other manner. It is as if there is something they feel is missing from the practice of their faith. They find something about the traditions of the E.O.C. fulfilling. I think if God’s word were more to them, they wouldn’t have the desire to feel their faith. I could be completely wrong here. This is just my opinion. Jesus, Prophet, Priest, and King! Patriotism is not the same as Christianity. Yeah, God forbid that Christians actually might want to experience their faith in more than a cerebral way. Gee, it’s not as if we have bodies or bodily senses or anything. Oh, wait. . . Nowhere in my article did I say that I don’t experience my faith in more than just an intellectual manner. I think that was a large assumption on your part. Not to mention rude. I have very deeply felt moments while reading scripture, while looking at the immensity of the sky, while singing hymns and psalms, while praying, and while having fellowship with brothers in Christ. Is there some reasonable and valid logical criticism of what I wrote, or were you just here to troll? The truth is often rude. If telling the truth is now trolling, then I happily admit to being a troll. By the way, I am not Eastern Orthodox. I, however, understand Eastern Orthodoxy and give it far more credit than you do. What you have done is assume that Orthodox Christians must lack “a high enough view of scripture …in comparison to their desire to experience their faith in some other manner” because they don’t agree with your johnny-come-lately invented-in-the-last-500-years Evangelical views. Now, think about it. You came to a theological conclusion based upon your preconceived Protestant notions and your very limited experience with Orthodox practices and beliefs. And I did the same thing – very purposefully – to you. Did you learn anything? Or will you simply say it was rude? Sirach 6:22. You might want to read The Mystical Language of Icons by Solrunn Nes. Or you could read The Meaning of Icons by Vladimir Lossky. Truth is neither rude nor polite. It simply is. I didn’t equate the truth to trolling. You did. I don’t agree with your assumptions about Eastern Orthodoxy, or what you assume about my faith. Here is your seemingly very emotional assumption, “…because they don’t agree with your johnny-come-lately invented-in-the-last-500-years Evangelical views…” This is obviously not based on truth, but on your presuppositions. You don’t know what I believe personally. You do seem to have a passionate affinity for the Eastern Orthodoxy. The truth of God, and His gospel are always true, and have never not been true. As soon as God created a being that could believe in Him, there was the one true faith. Eastern Orthodoxy can’t lay claim to that, outside what He has revealed about Himself through the progressive revelation. As long as they affirm that which He has revealed of Himself, they are within true orthodoxy. When they go beyond, or exceed that which He has revealed about Himself, they are outside of orthodoxy. This is true of all faith traditions. Can you adequately from scripture justify their use of icons and praying to the dead? I don’t think you can definitively show from scripture that this is orthodox praxia. You would, necessarily rely on extrabiblical traditions, or writings to justify your position. The earliest of the men of the one true faith, believed the revealed word of God, and their actions followed their beliefs. Abraham, Israel, Isaac, and Moses on through the prophets and into the Apostolic age relied on the word of God as revealed by the angel of the Lord, the Word of the Lord, prophets of God, the incarnate Word of God, and the Apostles, to teach them the truth of Him. The Holy Spirit was at work directing men towards Christ throughout history. My faith isn’t a, “johnny-come-lately invented-in-the-last-500-years Evangelical” one like you assume. You want to talk about presuming and assumptions, you make plenty of them yourself. I believe the one true faith that has always been. In regards to your last question of whether I learned anything from your emotional tantrum, yes, I learned that you are not truly concerned with convincing me, just arguing. There are plenty of other forums for you to do that on. This is my site. I pay for it. If you don’t like something I’ve written, too bad. I won’t be posting anymore of your comments unless you can get a reasoned thought out of your head and into type. Just try writing one, single, coherent, reasonable statement that supports the EOC practice of iconography. Not an entire paragraph, or essay, just one or two lines forming a statement/argument. Good luck with that you Roman Catholic apologist. Even if you did come up with a consistent argument there is no guarantee I’d post it anyways, since it would only be giving a voice to the apologist of satan. Rome has no gospel and there is no peace between God and the Roman Catholics as they are still in their sins and not forgiven. What do you think of them apples vladimir998? Get rid of the Council of Trent and then I might entertain talking with you again. Until then we have nothing to talk about. Repent and believe the true gospel of Christ. This is Bob Snyder of Snyder’s Soapbox. I am posting an edited response from vlad. I didn’t think it was necessary or beneficial to include all of vlad’s rambling screed because it would have been tedious for you. Instead I wrote a simple response in summary to his screed, and included tidbits from his screed so you could read how badly he argues. The bits in (parenthesis is from me.) The rest is from our RCC troll vlad. If you’re a Protestant, and you are, then your religion is exactly as I described it. This year is the 500 year anniversary of the birth of Protestantism after all. Can you adequately justify from scripture the novelty of sola scriptura? Can you even adequately justify from scripture the table of contents in your Bible? Can you adequately justify from scripture how you are any more equipped to say when something is justified from scripture than all of the Eastern Orthodox? Can you even see the presumption and hubris in your views? That’s exactly what it is. You’re not a Jew. You’re a Christian – but you do not belong to any of the ancient Churches. Your views are entirely Protestant. This is the 500 year anniversary of Protestantism. JOHNNY-COME-LATELY. Again, you forget that you PUBLISH your views. Don’t turn around and pretend they aren’t yours. They most certainly are in that you are dominated by them. I always do. That’s how I was able to so easily show how you are relying on your feelings and making assumptions. Even now I am at least two steps ahead of you. Ah, more feelings. Show me – adequately – from scripture that Sirach is not inspired, a non-canonical work. You can’t, …. Logically that’s not even the real issue. Oh, I know you FEEL it is, but when someone is logical and not Protestant is dealing with someone dominated by Feelings and Protestant, the real issue is always the dominant philosophy of the Protestant. His world view – his feelings – dominate everything he does. Already did. That’s why I’m not a Protestant. It is obvious to me that you remain ignorant of what my beliefs are. It is also obvious by your recalcitrant attitude that you are a bitter, ignorant, little Roman Catholic devil. For those of you reading this, I deleted his response because it was more of the same. He is just reciting the RCC talking points. I imagine he watched a few debates and want to go around being a jerk. So for your pleasure and mine, I’m not going to humor him any longer by posting his idiotic and banal screed. He repeats his assertion that Protestants come from the RCC and are only 500 years old, fully disregarding my information I tried to educate him with about the one true faith that has always been. The Protestant Reformation was not the creation of a new religion; it was the attempts of some faithful men to REFORM AN APOSTATE ONE. This demonstrates his lack of effort to really interact with the information. He employs ad homonyms, red herrings, and straw man, attacks. He repeats the nonsense the RCC spreads about Sola Scriptura, and refuses to honestly interact. I asked him for one or two short statements in support of his assertion. He failed, and wrote an extremely long screed/rant. He accuses me of doing what he is doing by being emotional and irrational. He arrogantly assumes superiority and victory. It is really quite sad. Maybe he should pay for his own site and write his RCC apologetics there. He really loved when I aligned him with satan. It gave him a lot of fuel. In the end he denies the true gospel for the RCC one of works righteousness. If anyone wants to read his last comment that was not posted, you can e-mail him. I’m sure he’d love to show his superiority again lol. I’d laugh if he weren’t going to hell. This is serious stuff here folks. People are lost and going to hell. The RCC is leading people to an eternal punishment. Many of my own ancestors were devoted Roman Catholics and are going to have the wrath of God poured out on them forever. This will definitely be the last post I will allow from the troll formerly known as vlad. Also interesting to note, he never once attempted do answer the one single question I asked.